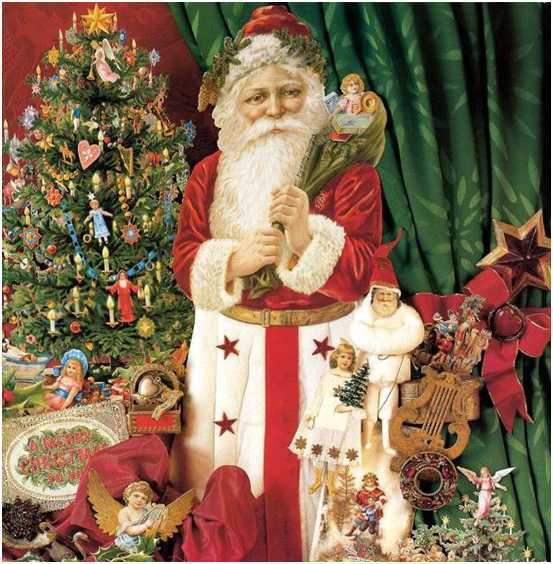 Xmas can be seen as other than in our today's mind views....as older-images of Santa give other meaning and value to what only a few could own, even before... but the IMAGE creates positive meanings even now. X-mas is not X defined, but one time to remind us that the December 21st winter's solstice has been shifted into human form and decorations to symbolize the giving in the colder weather's CHANGE of seasons. with what stuff can be saved, shined, eaten, and enjoyed remains. Or then to be luxuriously decorated and admired by those who have-less to envy. The benevolent smile of an elder male saint-like, who has accrued more and he might be willing to share, if the others act as if "good" family. older wiser men might lead the seasons and nations into more benevolent spheres. Times when stories told could not actually exist - but be pretended to be - with imagination providing what real life could not. Times when we were all not yet born or not 'operational' in this economic technological chaos of 2009. Times when wishes were heart-felt, and not on the internet or TV, and when wishes were personal and shared in real-live persons. Times when those who had-more were very separate and segregated, without media to make them available as 'friends to fans'. Times when envy was less lecherous or malicious but part of the imaginative hope for being more like the elite. Times that are not here now. Santa. The image. This is not christian or actually religious so much as representing those who-have and who- share. willingly. The sumptuous velvet and white furs, the expesive musical instruments and ornaments, the colorful shine in otherwise gray, dulled hard lives was the image-present, then given with pictures, cards and memories of what hopefully could be, but was not in most-lives possible. That imagination that titillated and glowed in all who had-less to spend on purchased gifts or materials. That love that was transmitted by hand-work, recycled materials renovated, and the time with effort each person dedicated to only the few to whom they could afford to give gifts. Sweet foods for those to whom they could give value but less. Nostalgia means wishing for the past to re-emerge as it was before. Not now. Remembering what may have existed before... that we can now revive and rekindle as a delight image of what the Winter Solstice Season can provide in meaning and sharings. The tree symbolic of nature, decorations the fruit of nature, candles shining as sky lights, et al. Let us remember that we can share - without buying more, spending too much, or expecting to get another object for our crowded spaces. Let us remember that the coming together in warmth when the cold outside is darker and just as the en-lightening days begin lengthening is the physical meaning of this sharing time, words, feelings, love, together, again. Let us be here in other ways, in this store-filled, media-exaggerated, mis-aligned, and politically-dangerous world that has scared so many of us into retreat and realizations - remembering too that the 'old' still carries positive reminders of meaning. And that we are still just barely human. And this prior-time Santa elicits images that can give kinder, deeper thoughts of each to one another - than the buy-buy-buy ones promoted all around our media-saturated minds now. Let this aged image be just what good feelings and thoughts emerge from the assumptions, wishes, that times-were-better-then, even if not so to most people. Let the images that brought kindness and sharing as the themes of giving prevail and uphold the cold and dark outside. Let the inside light up and smile benevolently on you too, and you on others and sweetness refresh our cynical ways and views of these automated fear-full days. Let this be a reminder that we are still who we and our families were before, regardless of religion, region, wealth or hard-work-options of a while ago. We are still family, in a more strained but still close way. Human family. Merry X-mas on any X day to you. "yep, me too... I am having an out-of-money but an Xmasy kind of experience."